U.N. officials warn the deadly Ebola virus could be spread by refugees leaving the Democratic Republic of Congo's North Kivu province. Officials are urging neighboring countries to increase surveillance at border crossings. More than 100 armed groups are involved in long-standing conflicts in DR Congo's North Kivu province. 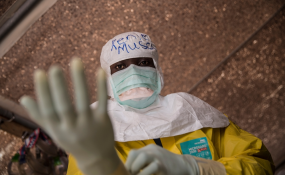 Ongoing fighting and instability in the region are adding layers of complexity and difficulty to international efforts to combat an Ebola outbreak in the region. At least two decades of conflict has displaced more than one million of the province's eight million inhabitants. Peter Salama is World Health Organization emergency response chief. He tells VOA an additional threat is posed by refugees. He warns some of those fleeing into neighboring Uganda, Tanzania and Burundi may be taking the infection with them. "So, not only do you have the problem of tracking that internal displacement, but then you have the potential exportation of infection across borders," Salama said. "And, that is why we are already working with the government of Uganda particularly, but also Rwanda, which shares a border as well with northern Kivu to be fully prepared for any eventualities across the border." UNHCR spokesman Andrej Mahecic says his agency's staff in Uganda, Rwanda and Tanzania are on Ebola alert. "Specifically, in Uganda, we have a continuous influx from the DRC. Our operation has intensified the awareness-raising among the refugee and host communities. We have also increased the infection control and outbreak preparedness measures," Mahecic said. "And, we also are preparing for entry screening, that could be the temperature checks for arriving Congolese refugees at the borders." Mahecic says around 92,000 Congolese refugees have fled to Uganda so far this year. He says they are continuing to arrive at an average rate of between 100 and 200 a day.